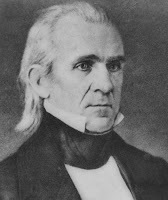 With the border region of Mexico and the United States in dispute, James Polk initially set out to achieve diplomatic reconciliation. But when Mexico declined his initial buy-out offer, Polk deemed Mexican presence in this disputed region enough to declare war. Over time, U.S. military strength caused Mexico to concede and accept financial terms less than originally offered. While this resulted in a substantial increase of American land, it also enraged a neighboring country where resentment of this action still lingers today. At both of his inaugural balls (yes, he had two) he ordered the dancing to stop. As soon as he and his wife left either, the dancing resumed immediately. I think that we should end this feud once and for all. We need a fence, that is right, 700 mile fence to not allow any Mexicans to come passed the 1969 mile US-Mexican border. Problem solved: James Polk still a failure but America wins.